Can Bright, Romantic 'Cinderella' Match Dark 'Maleficent' at Box Office? Disney will find out soon if its brilliant, lavish and cheery “Cinderella” will prove as profitable as Angelina Jolie‘s dark, menacing and edgy “Maleficent” was just 10 months ago. A Liam Neeson mob thriller, “Run All Night,” opens Friday too, but “Cinderella” is the belle of this box office ball. Winning the weekend is a given for the perky “Cinderella,” but can it boost the bottom line as did “Maleficent,” the last classic Disney plucked from its vault for a live-action makeover? Last May, with Jolie as the Evil Queen, the “Sleeping Beauty” update debuted to $69 million, grossing $241 million domestically and $758 million worldwide. That’s a very high bar. “Cinderella’s” opening should come close say the analysts, who believe post-“Frozen” “princess power” — that is to say young girls — will lift “Cinderella” to roughly $60 million this weekend. And they won’t be shocked if it goes higher. The two PG-rated fairy tale updates have much in common, but their differences are significant. The production budget on “Cinderella” is $95 million for example, about half that of “Maleficent.” David Barron, Simon Kinberg and Allison Shearmur produced for Walt Disney Pictures. Lily James from TV’s “Downton Abbey” plays the stepsister who undergoes a magical makeover in “Cinderella,” and Richard Madden from HBO’s “Game of Thrones” is her Prince. Those two combined don’t bring the box office heat of Jolie — who does these days? — which could matter overseas, where “Cinderella” will open this weekend in roughly 30 markets including China. The supporting cast is more well known, however. It includes Cate Blanchett as Lady Tremaine, Helen Bonham Carter as the Fairy Godmother, Stellan Skarsgaard as the Grand Duke and Derek Jacobi as the King. Kenneth Branagh’s direction, Chris Weitz’s script, Dante Ferrettti’s production design and Sandy Powell’s costumes have combined to make “Cinderella” as gorgeous and classically romantic as “Maleficent” was edgy and vaguely scary. That should make it more appealing to younger girls, but could make it less attractive to tweens and teens, especially boys. “Cinderella” will be on 3,845 screens, but it’s not in 3D. “Maleficent” was, and debuted in 3,948 theaters. The box-office boost that “Maleficent” received from the up-charges wasn’t huge, with 3D screens accounting for 35 percent of the grosses. “Cinderella” will get a full 336-theater IMAX run, as the giant screen chain continues to target a broader audience. “Maleficent” drew $6.7 million, or nearly 10 percent, of its grosses from IMAX theaters. The first is momentum from the success of “Frozen,” which aimed primarily at young girls and connected so well that it became the highest-grossing animated film ever. To capitalize, a new Disney Animation short, “Frozen Fever,” will be shown before “Cinderella” screenings, starting with Thursday night’s early shows. The reviews on “Cinderella” are stronger, too. It’s at 89 percent positive on Rotten Tomatoes, while “Maleficent” was at 46 percent. In terms of social media, “Cinderella” is behind “Maleficent” on Twitter, but well ahead on Facebook, suggesting that it will track better with families. Advance sales for “Cinderella” are outpacing those for “Maleficent,” “Oz: The Great and Powerful” and “Snow White and the Huntsman” at a similar point in their sales cycles on Fandango and MovieTickets.com. The weekend’s other wide opener is Neeson’s “Run All Night,” a Warner Bros. action film directed by Jaume Collet-Serra. Joel Kinnaman, Ed Harris and Common co-star. The R-rated thriller is about an aging hitman (Neeson) forced to take on his brutal former boss (Harris) to protect his estranged son (Kinnaman). Brad Ingelsby wrote the script. 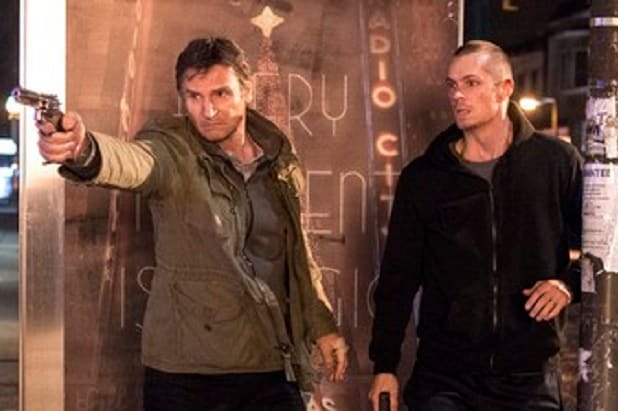 Collet-Serra and Neeson also teamed on “Unknown” and “Non-Stop,” similar films that opened to $29 million and $22 million in 2011 and 2014, respectively. Warner Bros. would love to see numbers like that, but tracking suggests the $15 million range. “Run All Night” is a counter play to the very female-skewing “Cinderella,” and will be in roughly 3,150 theaters. Fairy Tales Invade Theaters: Hollywood’s New Superheroes?